Time is just flying by. As Edward de Bono said - it's mathematically sensible. For example if I was a small boy of ten and asked for a biscuit and was told I could have one in one hour, the perceived time for an eighty year old man would be ten times more - or eight hours to wait. That's why time gets faster and faster as we get older. 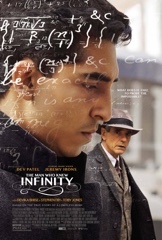 It was a true story about the Indian mathematician Srinivasa Ramanujam Iyengar who came to Cambridge University at the beginning of World War One to confound the very crusty and sometimes racial men at the University. Jeremy Irons took him under his wing to promote his genius. It sounds dull and complicated but believe me it was a fascinating film. I highly recommend it. (It must have been good as I didn't fall asleep during the performance ). My young friend does give me a bit of a look when I eat my ice cream at the cinema as I take along my own silver spoon - because the little wooden ones that come with the ice cream tubs are too short and I end up getting my fingers covered in sticky ice cream! I only have a bet once a year - and that's on the Grand National. And I never back favourites, as if I'm going to win I want to win a decent amount and not just double my money. My method is to look at the names of all the runners, then choose names that mean something to me. This year I chose a horse called 'Vic's Canvas'. The reason being that my good friend Vic Granger( sadly no longer with us), a fellow artist I've known since our apprentice days, painted on canvas. So I put a place bet of five pounds on it. It didn't win but came third at 100 to 1. My winnings came to £130! For the past couple of weeks I've been working on a small watercolour commission of a young RAF Officer. It will be framed tomorrow so I'll show it here after the client has seen it and given me permission to post it. 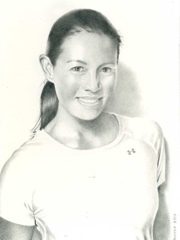 In the meantime I finished this pencil drawing yesterday. My young friend made a lovely dinner last Sunday week and we invited Debbie McGee and her sister Donna over for the evening. Debbie is, of course, devastated by the loss of Paul but they enjoyed the evening. At last my big boat is back at my mooring, complete with its safety certificate, insurance and licence. So we spent time at the weekend giving it a complete power clean - at least on the outside. This weekend we've earmarked to have a go on the cabin and the rest of the inside. The dinghy should be brought back from the boatyard tomorrow after the extensive repairs that Alan made on its hull. All we need now is some good weather over the next few weekends. 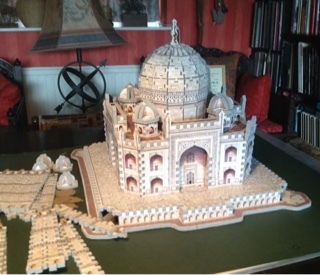 Our 3D jigsaw puzzle of the Taj Mahal is almost done - just the four upright towers around the perimeter to complete. It really has been an interesting puzzle. We might buy the Eiffel Tower next. 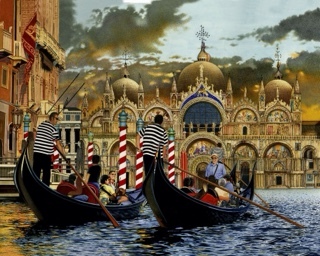 Talking of jigsaws my painting of Venice at Sunset is currently being made into a jigsaw by the Wentworth Wooden Jigsaw Company. It should be released in a couple of weeks. 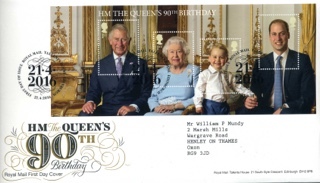 Her Majesty the Queen is celebrating her 90th birthday today. She's been an incredible monarch and I'm so pleased to have lived during her reign. 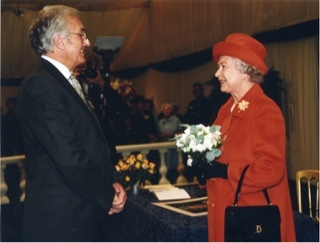 I had the great pleasure of meeting her a few years ago when she came to Henley. I had been commissioned to paint a miniature of one of her horses - Phantom Gold. After the presentation we were able to chat for a short while. May I add my good wishes to her on this very special day. The post has just arrived and with it my first day cover. What a lovely set of stamps.